Our brokerage office is a thriving operation that deals with with a large turnover of previously owned boats. This is an integral and valued part of the service the boatyard gives to members of the public and existing customers alike. When a customer puts their boat for sale with the Retreat Boatyard, they get first class advice and guidance with an experienced broker on hand to guide and advise all the steps of the way. Our boats for sale are advertised in the yachting press each month and most sell very quickly, especially those presented ashore in the yard in a good clean condition. 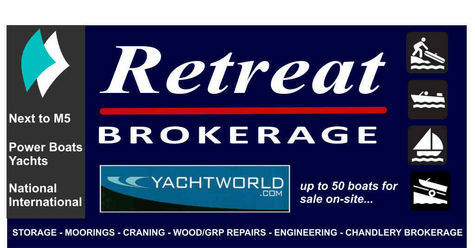 Bills of Sale, re-registration, finances are all undertaken by the broker acting on behalf of the vendor and we hold a list of surveyors who are registered by the (YBDSA), Yacht Broker, Designers & Surveyors Association.Please browse through our site by using the navigation buttons on the left - and please visit our main site www.retreatboatyard.com for view of all we have to offer. 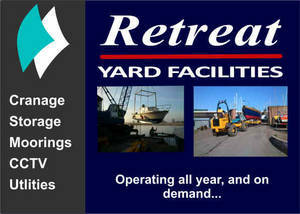 The Retreat Boatyard offers craning every day, all year around (tidal dependent). Boats are predominantly moved with a bespoke Roodberg 15t mover, and stored on-site in our own secure compounds offering parking, electricity, water and waste disposal. As required boats can be supported with 4 point cradles, Brownell three point stands or Roodberg lift and move cradles. As well as land storage, flexible moorings provision to 56 boats is available opposite the yard, with pontoon and tender access with free dinghy storage. Just ask and we can provide a package that suits your needs. Retreat Boatyard provides a fully equipped repair facility specialising in wood and FRP/GRP, with two qualified shipwrights and one fitter. We offer extensive experience in epoxies, polymers, urethanes, 2-pack systems; and have a heated/conditioned treatment centre for International Osmosis and Interspray paint systems. 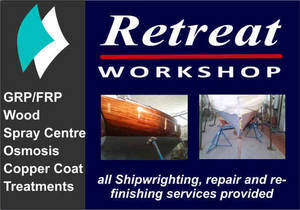 So whether you need a gel/GRP repair, your keel replaced/re-conditioned of a full hull treatment, please call. This Beneteau 375 has just arrived and will be having internal photographs taken very soon. She is ashore for ease of veiwing. The Beneteau 375 has been well maintained and well used and has just returned from France. She has had a new 29hp Volvo engine in 2013. Ships papers and ships history along with manuals are available when purchasing this vessel.